This microscope is equipped with a motorized Super Z stage, motorize water cool turret, and 10X, 20X, 40X and 63X high NA objectives, capable of DIC and IR imaging. It is equipped with three laser systems for excitation: i) a white light laser (WWL2), ii) a 405 nm DMOD laser, and a iii) a 355 nm violet HeNe laser. This confocal also has the AOBS for tunable excitation for up to eight line simultaneously, all with very step transitions (<5nm). This is an extremely bright and spectrally flexible beam splitter that will allow for tremendous synergism with the white light laser. 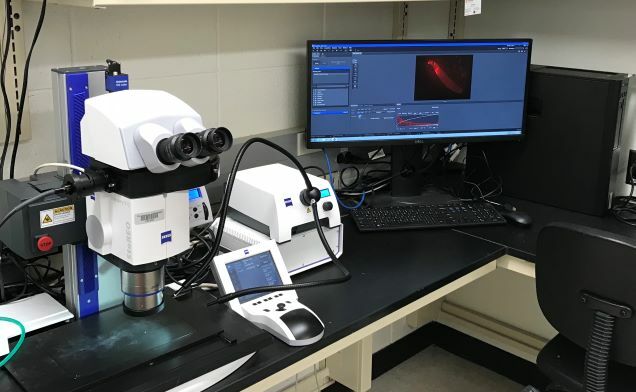 Also equipped with three HyD detectors and a resonant scanner, this confocal microscope is both extremely fast and sensitive. 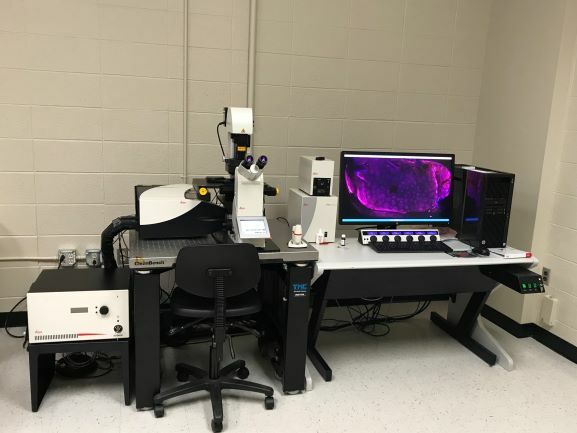 This confocal also has a powerful workstation with several software modules including: i) LAS X system for control of microscope hardware, ii) Live Data Mode, iii) 3D visualization tool, iv) 3D Analysis tools, v) Wizards for FRAP, FLIP, and FRET, and vi) Hyvolution for super resolution down to 140nm. This microscope has both dark field and epifluorescent capabilities, and a mechanical stage for automated stitching. This microscope also has a 10X, 20X, 40X, and 100X Enhanced Contrast Plan NeoFluar objectives, capable of collecting high contrast images throughout the visible spectrum. The microscope has a powerful graphics workstation for image acquisition and image analysis using Axiovision software for basic morphometrics and Stereologer software (SRC Biosciences) for stereological measurements (number, length, surface, and volume). This stereomicroscope is ideal for collecting deep macroimages at 5X to 150x magnification. It has a Plan S 1X and PlanApo S 1.5X objective, each with a large working distance and field of view. 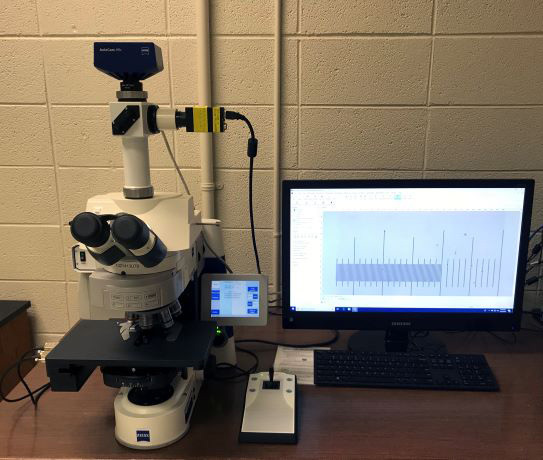 This stereomicroscope has both fluorescent and bright field light sources, and dichroic filter cubes for both GFP and RFP imaging. The stereoscope also has an Axiocam 105 color camera capable of high color reproducibility and high contrast imaging. The scope has a motorized stage, zoom, and focus controlled by its own workstation. This workstation runs ZEN 2.3 software with quantitative measurement and 3D imaging modules. The instrument is an integrated microscopic system capable of automated analysis of particles in a moving fluid. 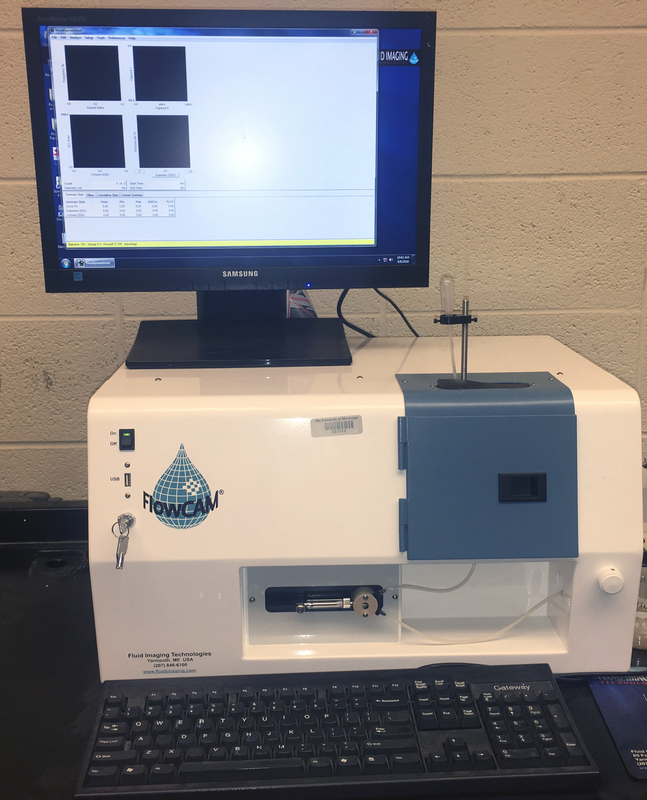 The B3 Flowcam combines capabilities of microscopy, flow cytometry, and fluorescence detection, and can automatically image, count, and analyze cells in a continuous flow.